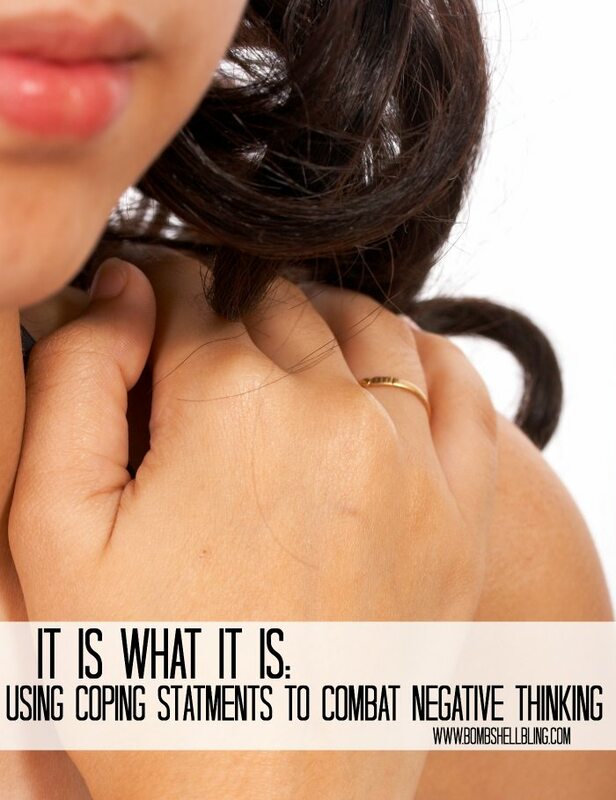 Sarah here: I decided to republish this article that my sister wrote for Power of Moms about using coping statements to combat negative thinking because I myself that been struggle with so much negative energy and thought since my miscarriage. I hope her ideas hope out a few other people out there! Now I will turn the time over to Rachel. I am sitting in my car at a red light. My 15-month-old son is screaming in the backseat, and I am a ball of frazzled nerves. As we were walking out the door for his doctor appointment, cutting it close on time as usual, he had a blow-out diaper, and now we are going to be late. My negative self-talk continues, and by the time we reach the doctor’s office, I have convinced myself that I am a failure as a human being, and I might as well give up on the day altogether. Obviously, my response to this situation is a gross overreaction (and may have been embellished a bit for the sake of a good story); but I will admit that as a busy, imperfect, young mother, I feel stressed out a lot of the time, and I am very, very hard on myself. This critical way of thinking about myself and my life is totally ineffective. It doesn’t motivate me to accomplish more or to do more; if anything, it actually makes me less likely to make the most of the day because I feel so discouraged. A few months ago, I decided that I’d had enough of my negative thinking, and I attended a class about dealing with stress in healthy ways at a local counseling center. We met multiple times and discussed ways to regulate our emotions when we are faced with enormous trials that are out of our control (such as the death or illness of a loved one), as well as ways to deal with everyday stresses—the types of stresses that are inevitable in motherhood. The most effective strategy that I learned from this class is the use of “coping statements” when I am in the midst of a frustrating moment. Coping statements are short, pithy sentences that remind me to focus on the now instead of the past, accept the situation for what it is, and be kind to myself when I make mistakes. My favorite coping statement is “It is what it is.” It has become a sort of mantra for my life because it applies in so many circumstances—sometimes situations that are out of my control (such as when my son doesn’t take a good nap and is unbearably grumpy) and sometimes situations that are the result of my silly mistakes (such as when I forgot to pay our rent when we were on vacation and thus incurred a late fee.) It is what it is. Life is not perfect, and I am not perfect, and that’s just the way it’s always going to be. This simple, five-word sentence has made a noticeable difference in my daily stress and happiness levels. Now when I am running late to an appointment because of a blow-out diaper or some other unexpected calamity, I take a deep breath and repeat my mantra. It is what it is, and no amount of stressing, worrying, and guilting myself is going to change this situation now. I will face whatever consequences result, and I can apply what I’ve learned from this experience in the future—but for right now, I am going to choose to let it go. Through the use of coping statements, I have learned to accept myself and my life—imperfections and all—and as a result, I am generally a much happier, more positive person than I was a few short months ago. QUESTION: Which situations in your daily life are most likely to send you spiraling into negative thoughts and a resulting dismal mood? CHALLENGE: Sit down and brainstorm several original coping statements to address your particular needs (or use the ideas listed in this post). Next time you are faced with a stressful moment, repeat a coping statement a few times, and give yourself permission to let it go.